Head coach Jed Stugart claps as the football team runs onto the field before the Homecoming game. 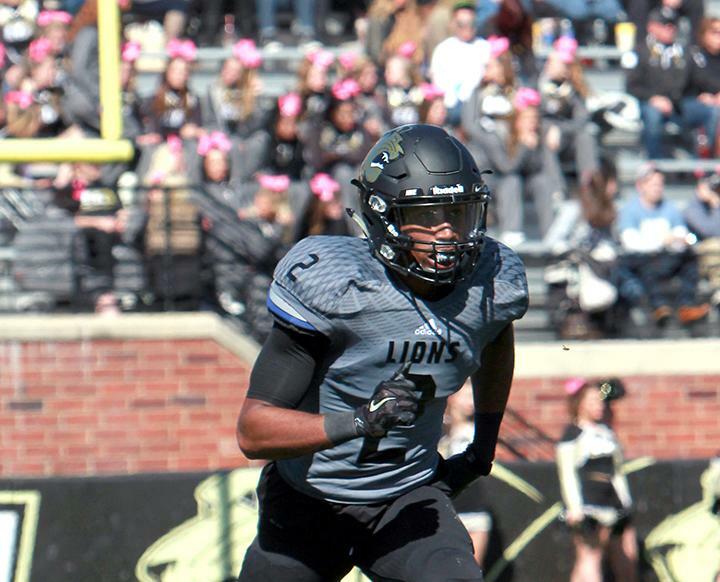 The Lindenwood football team defeated Emporia State at an away game Saturday afternoon. Nash Sutherlin and Cade Brister were the standouts for the Lions, with Sutherlin carrying for 166 total yards and Brister throwing for 308 yards. This is the first time in program history that the Lions have defeated the Emporia State Hornets. The Lions have faced the hornets six times. Last year’s matchup, Lindenwood’s homecoming game, went 41-30 for the Hornets. A scoreless first quarter for Lindenwood saw the Hornets up by 13 points. The Lions came back in the second quarter, scoring three touchdowns and ending the half with a score of 21-20. The Lions started off the second half with by scoring two back-to-back touchdowns. Emporia state scored the final points of the game, but it was not enough, and Lindenwood won by a score of 48-41. The Lions’ next game will be at home against Pittsburg State on Saturday, Sept. 29. Kickoff at the Harlen C. Hunter Stadium will be at 1 p.m.